Are You Ready for Your Tour du Mont Blanc Adventure? You’ve never seen nature at her most beautiful until you’ve visited the Mont Blanc massif. You’ve never enjoyed nature until you have done so in the context of the hospitality of the Tour Du Mont Blanc Hotels, B&Bs and refuges. The people are as amazing as the place. The Mont Blanc massif is a European mountain range that lies across France, Italy and Switzerland. It is named Mont Blanc (meaning ‘White Mountain’), and is the highest mountain in Western Europe and the second highest on the entire continent. It is home to eleven independent summits, all over 13,123 ft (4,000 m) high. On the massif, you’ll encounter several glaciers, including Mer de Glace, the longest glacier in France, and Miage Glacier, the longest glacier in Italy. Picture yourself walking through one of its seven valleys, which the ancient Romans used as communication routes until the 5th century AD (the evidence of this can still be seen today). Or simply savour the entrancing view of its glaciers and mountains, their rich meadows blooming with colourful flowers. It’s this view, and the opportunity for outdoor recreation and relaxation, that attracts thousands of visitors like you to the Mont Blanc Massif every year, transforming it into a major tourist attraction. The Tour du Mont Blanc has even been seen as legitimate therapy by leading professionals. Mont Blanc Massif is also home one of the most popular long-distance walks in Europe – the Tour du Mont Blanc. The Tour du Mont Blanc is an eleven day circular trek that covers over 110 miles (170 kilometers), with numerous accommodations along the entire route, making it possible to break your journey into comfortable stages. Salamander Adventures has been organizing Tour du Mont Blanc treks since 2007, taking about 150 people on the trek every year. With more than 30 years in the adventure holiday and hospitality business, we have an intimate understanding of your expectations on any adventure, and do our best to exceed them. Over the years, we’ve cultivated strong ties with local hotels, ensuring our ability to deliver you amazing hospitality on your Tour Du Mont Blanc; great food, great people, great sights, great sounds, great fun! Our seasoned guides are trained professionals, versed in the lore of the Tour du Mont Blanc and the Mont Blanc Massif and its delightful little secrets, such as where you can catch its dazzling sunsets to the best advantage. You can count on them to lead you safely through the tour from start to finish, setting a pace that’s just right for you. They are hospitable hosts who will become your friends. If you’re feeling really adventurous, you could set off on your own self-guided tour of Mont Blanc. Whichever adventure you prefer, Salamander Adventures is at your service and can get you the help you need. 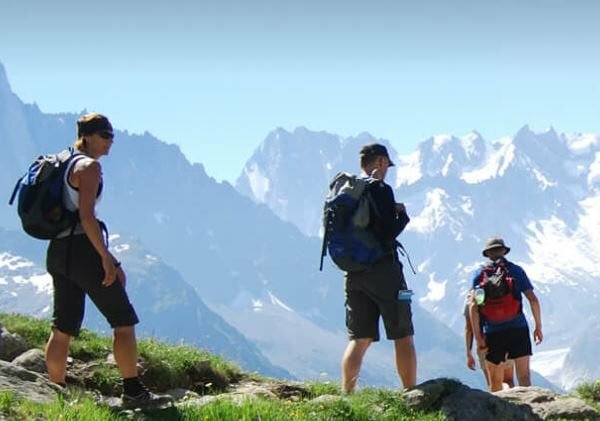 Salamander Adventures runs three different treks of the Tour Du Mont Blanc, so you choose which one is right for you. If you would like our guided tour, self-guided tour, or the budget tour, click on the link to the one of your choice to make your booking arrangements. All booking must be made in advance and will be confirmed only when we receive confirmation of payment. Salamander Adventures is a member of Travel Trust Association. Any money you pay is held in trust by the TTA until your trek is completed. Only then does the TTA release the money to us. For more information, and to learn how you can cancel your tour if you choose to, please read our terms and conditions. Or you can contact us at 01273 256753 or by email. We’ll be happy to assist you in any way we can. If you’re ready for a wonderful adventure filled hospitality, lush scenery of flowers, wildlife and flowing rivers, then you’ve come to the right place.